On May 9, 2001, the Disclosure Project hosted a major event at the National Press Club in Washington, D.C. This historic event had witness testimony from twenty to twenty-five military, intelligence, government, and corporate individuals involved with UFO projects over the past fifty years, who presented their information before a worldwide group of media correspondents. "Those of us who were military witnesses of UFO history showed official government documentation with detailed testimony. Our focus was and is on the facts and documents. Our purpose was and is to get the mainstream media and government officials to hear those facts and move us toward an honest congressional inquiry. We who came forward want to ban weapons from space and stop aggressively shooting down these space vehicles and their extraterrestrial occupants. We need to declassify the advanced electromagnetic propulsion systems in use by the secret government, start producing them for the world to use, and thereby help save this planet. The people who had been employed in agencies within the military and knew the truth about UFOs were sworn to secrecy. Now I am finally relieved to speak the truth. We military men who hold on to this knowledge are getting old and dying, and we want the truth to come out. We will either do it ourselves or leave it for our children and wives to do. Personally, I have told those on Capitol Hill that I am being led to do it by the aliens themselves. They have convinced me that it is time. They have been waiting on the government, and if the government does not come forward with the truth, then the aliens will take a more public role in disclosure." Submitted by J. Levin on Tue, 12/02/2008 - 15:12. Submitted by DuBman: Atlanta GA on Wed, 04/18/2007 - 15:11. Daniel M Salter is a fine US citizen with the guts and glory to tell the truth. The truth is so rare in this day that it is barely recognizable to the masses. Having done more research on this subject than i care to admit, I can say ,this man's account is it, the "Cosmos". All one need do is listen to others from within the "Black Projects" who attest to Salter's claims and experience and are able to corroborate what this honest man has to say and why. If you are ready to write this man;s account off as fake, you will be keeping your head and soul in the sand. Submitted by England on Fri, 06/25/2004 - 15:00. I have found this the hardest book I have had to review so far simply because I cannot tell if the contents are true, partially true, or totally made up by the author. Daniel Salter was a witness in Steven Greer's Disclosure Project back in 2001. Greer collected together a large number of insiders who had worked on UFO matters during their mainly military careers and presented them to the press in Washington in the hope that the publicity would force the American government to go public on what they knew about UFOs and ET. The plan has so far failed, but has nevertheless brought into the public domain people like Salter who would otherwise have probably gone to their graves without their stories ever having been heard. My own feeling is that some of what he writes might be true and some of it won't be, which isn't really fair on you, the reader. However, in his defence, the Disclosure Project didn't just accept anybody to go and stand in front of the press, and so his credentials will have been checked out as will his story. By now you will have got the general idea of this book and there is a great deal more of this type of information in it. Sceptics wouldn't touch it even if you paid them to. I certainly found it an enjoyable read, in fact enthralling at times, but it left me confused. Did I or didn't I believe him? That is a question for you to answer if you buy the book. I cannot help you here. Part of the problem when reading books like this is that the author's ego gets in the way and often it is a case of "How marvellous I am that I have done this or seen that and I know something that you don't." That is not the situation here. Salter's style is modest and unassuming and that adds to the problem. But, whether it's true or not, I can't get away from the fact that I enjoyed reading it and on that basis, what better recommendation? Submitted by Elohim Soldier on Sat, 11/29/2003 - 14:56. After 12 years of training in the US.Marine Corps. I wanted to use my creativities for the benefit of humanity...loving people helping people. Dniel M. Salter and Nancy are selected leaders of our time...fallowing them and we shall see the infinite light of harmony. This is a collectible information. It is a fascinating book! Submitted by Scottsdale, AZ on Mon, 11/17/2003 - 14:54. Submitted by Metro DC on Sat, 01/10/2004 - 14:53. 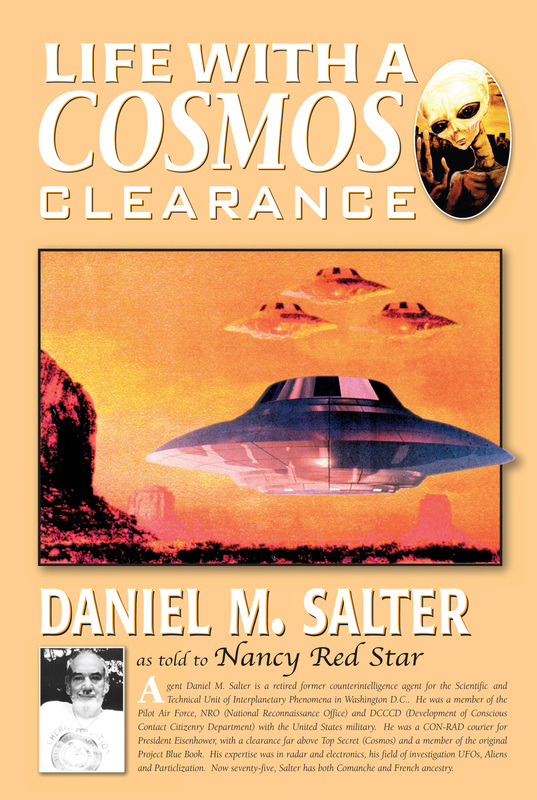 Nancy Red Star has succinctly captured the spirit and intent of Daniel Salter's testimonial of the planet's historical and current interaction with life on other planets as well as within other dimensions. Weaving the internal struggles (personal pathways) and external pressures (governmental resistance, control and power) of transitioning this planet into a higher level of existence and into the greater neighborhood is the challenge that must be faced within the next five or six years. Salter exposes the motives of self-interest and paranoia that prevade our species but also points to our potential to reach a higher level of existence. Salter also honors the work and sacrifices of others who have sacrificed themselves in this process of educating the public. His courage and integrity are to be commended. He is taking a major role in this tranisition process. This book is highly recommended for those who seek the truth..without the spin.